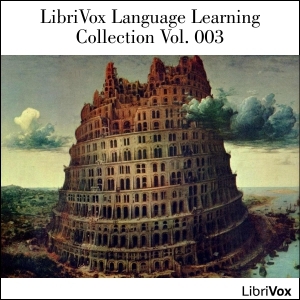 Listen to "LibriVox Language Learning Collection Vol. 003" on your iOS and Android device. This collection is part of an initiative to create a language learning resource at LibriVox. The LibriVox Language Learning Collections contain readings from various language learning books, grammars, primers, phrasebooks, dictionaries, readers and even other works which contain information on various languages, recount experiences of language learning and encountering new languages or provide guides for correct pronunciation, writing or discourse in a language. These works could describe English or any other language whatsoever, from Latin to Sumerian, Chinese to Wampanoag, Esperanto to Swahili (etc.). This volume includes 'Abdu’l-Bahá's talk "On the Value of an International Language"; the first section of L.L. Zamenhof's "First Book" (Unua Libro), explaining his great invention—the International Language, i.e. Esperanto; the third Lesson of Barrs' "Beginning Latin"; Gustave Chouquet's "Easy Conversations in French" (11 - 14); Lessons 21 - 25 from "Greek Lessons" by W.H. Morris; Introduction from "Hand-Book of Volapük" by Charles E. Sprague; Leccion Tercera, from "New First Spanish Book", by James H. Worman; Lessons 11 - 15 from "Esperanto in Twenty Lessons" by Caroline Stearns Griffin; Lessons 26 - 30 from "A Practical Arabic Course" by E. Nématallah & E. Chevalley; two sections from the "Student's Greek Grammar" by Georg Curtius; the Preface from "A Grammar of the Persian Language" by the great linguist, Sir William Jones (1746 - 1794); the Preface from "Arabic Syntax chiefly selected from the Hidayut-oon-Nuhvi" by Henry Brown Beresford (d. 1869), which is based on the famous Hidāyatu'n-Nahw by Ibn al-Hājib (1174 – 1249 CE); Chapters 3 - 8 from "Slips of Speech" by John H. Bechtel and, lastly, The Alphabet/Classifications of Sounds from "New Latin Grammar" by Charles E. Bennet.